An archive extraction directory traversal vulnerability has been found in AndroZip File Manager. 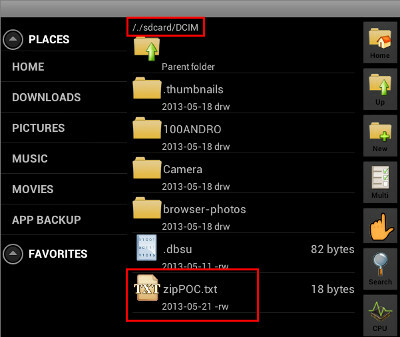 When exploited, this vulnerability allows an anonymous attacker to write files to arbitrary locations within the SD card of the user's Android device. This advisory discloses an archive extaction directory traversal vulnerability in AndroZip File Manager. When exploited, this vulnerability allows an anonymous attacker to write files to arbitrary locations within the SD card of the user's Android device. Extract the POC ZIP archive into the Download directory. i.e. 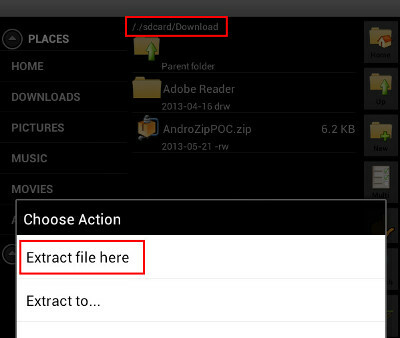 choose "Extract file here"
Update to version 4.5.6 via the Play Store. 2013-05-21 - Initial Vendor Notification By Email (no reply). 2013-05-22 - Second Vendor Notification By Web Form. 2013-05-22 - Vulnerability Details Sent to Vendor. 2013-05-24 - Asked Vendor for Release Date of Fixed Version (vendor replied with estimated date). 2013-05-28 - Vendor Released Fixed Version.